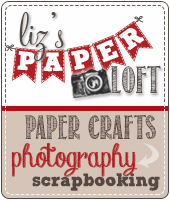 Liz's Paper Loft: PKS and MKC Join Forces ~ Happy Easter! 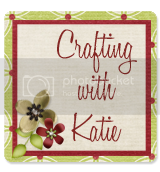 I'm thrilled to have you join us for day four of fun with Miss Kate Cuttables and Peachy Keen Stamps! The products from these two companies work so very well together and we’re fixin’ to show you just how well! 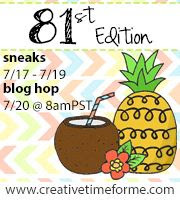 Haven't you loved what the other designers have been sharing so far this week!!! Today, is my turn to share with you my project. I decided to create fun Easter baskets for my coworkers. 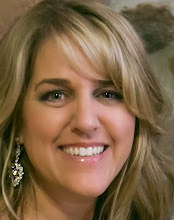 True to traditions, both Miss Kate Cuttables and Peachy Keen Stamps will be offering a very generous prizes and GRAND PRIZES. Check out the graphics below for prize details, and following that, you’ll find the information about what you need to do to win some of these fabulous prizes that are being offered! 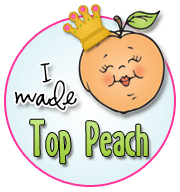 GRAND PRIZE by Peachy Keen Stamps is a $75.00 Gift Certificate to one lucky person who follows the hop each day, comments on each blog post, and Follows each blog. Don’t miss any days in the commenting and following to be sure to be in the drawing for this awesome prize! HOLY MOLY! Those are some WONDERFUL PRIZES! These are so so so cute Liz! The fence box is so fun and your eater critters are just adorable! FANTASTIC job! What an adorable treat box you've got going on there. Fun and cute all rolled in to one. Great for Easter favors. I love the fence box. Adorable! I love that the box is made of fence with a grass border. 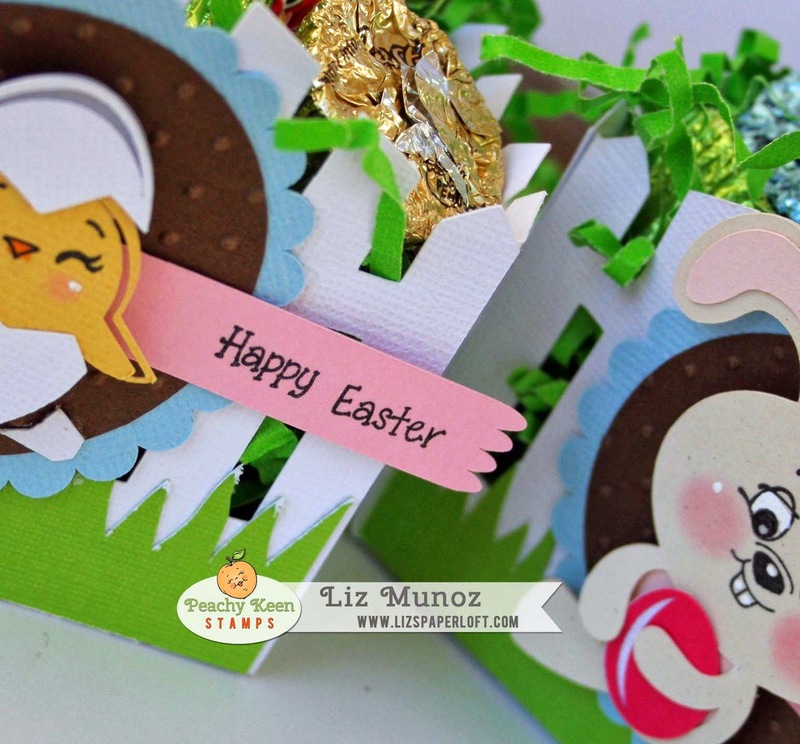 Your little Easter treat boxes are so cute. What a lovely whimsical project!! You are very talented, thanks for sharing your work. Love those CUTE PK faces!!! Super adorable! I love your darling faces and the wonderful "baskets" . You are very talented! 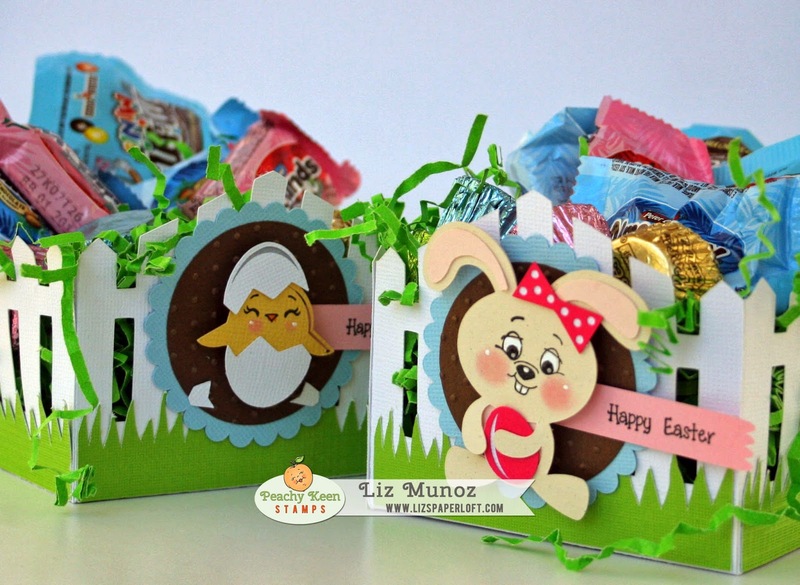 Love the fence boxes with the MCK chick and bunny on front stamped with adorable Peachy Keen Stamps. Really cute! love your ideas. 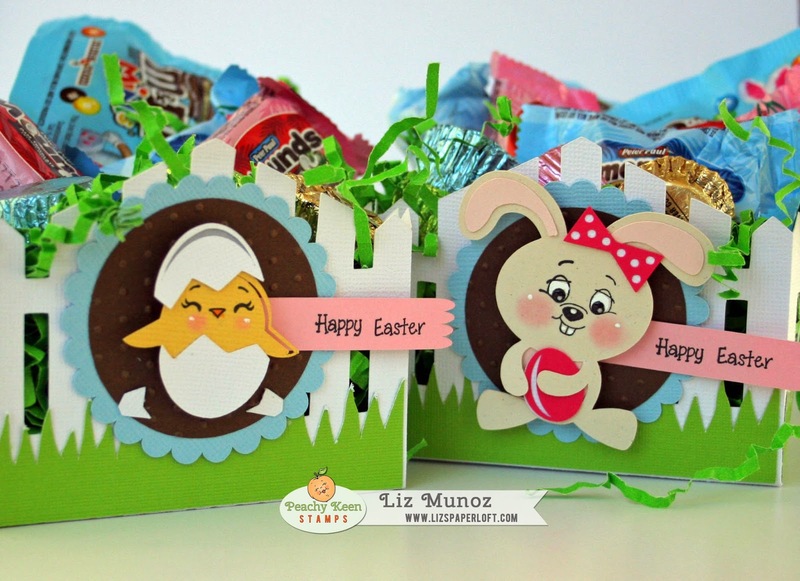 hehe loving your super cute Easter critters Liz!!! This is another fabulous ensemble and it's completely inspiring! I gotta get me some Miss Kate Cuttable asap!!! Thanks for being a part of today's co-hop! Both are ADORABLE!! 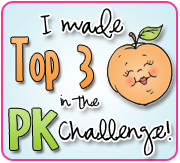 The PK faces are so SWEET and the MKC images are too darn cute! Super cute. Love the fencing. The fence treat box is so cute. This is fantastic! I love the cute Easter treat boxes. Thank you for sharing. Love the fence box. It would make an awesome holder for some Easter candy. Your Easter baskets are so adorable! How adorable are these? I bet your co-workers love them! Your treat boxes are adorable. Love those faces. I'm a follower. Your little treat boxes are simply adorable! I am a follower of your blog. What a cute project! Who wouldn't just LOVE to receive either one of these little boxes! They are both adorable. Very cute boxes. I love the faces you chose. I follow your blog. I have been enjoying this fun week long hop! Your friends will love these sweet treat baskets. The box is a perfect and pretty box cut. Your chick and bunny are so cute with their Peachy faces. Super cute job! I love this project, how can they get any cuter. The bunny's face says it all. I am loving your treat baskets, what a great idea!! What a fun Easter basket! Love those cute little critters and those adorable faces! Cute baskets. Love the faces. such super cute treat boxes! Love them! I love the fence box, very cute. I love your adorable treat boxes The face on the bunny is soooo cute. How beautiful, your treats are just beautiful, thanks for sharing! The buck teeth are precious. Amazing and adorable! Thanks for co-hopping with us at Miss Kate Cuttables this week! These are such sweet little baskets!! Love the embossing and sweet peachy faces. That is the most precious project ever!!! Super cute. Someone is going to get lucky on Easter. Love everything about this! The picket fence box is fun to go with the cute stamps and cuttables. This is an amazing project! Happy Easter! I have this box file. Just need to add some cute embellishments. Yours is adorable. Thanks. So cute love the fence box. CUTE! Thanks so much for sharing these sweet little baskets. 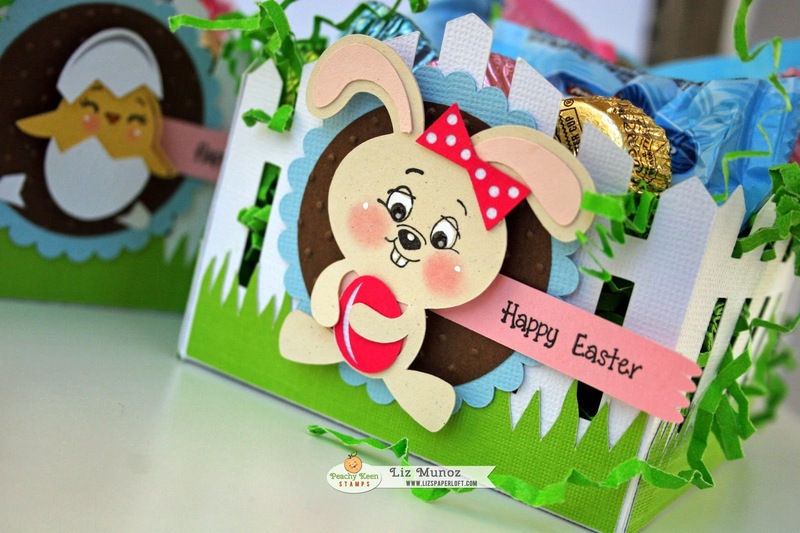 Your Easter treat boxes are adorable! 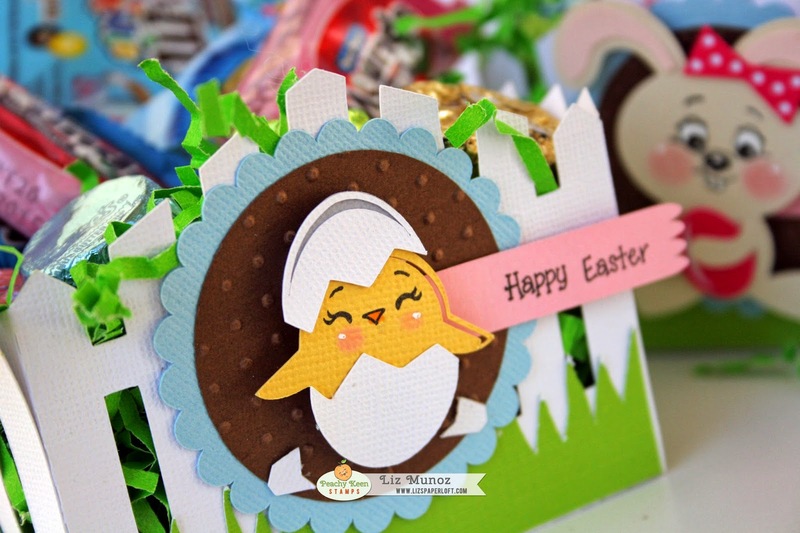 Love the fence box and the hatching chick. Very cute! these boxes are adorable with those cute critters! TFS Liz! Liz ~ Well these are simply ADORABLE and I want one even if its late!! How CUTE is that bunny and that chick~ EEK! So CUUUTE!